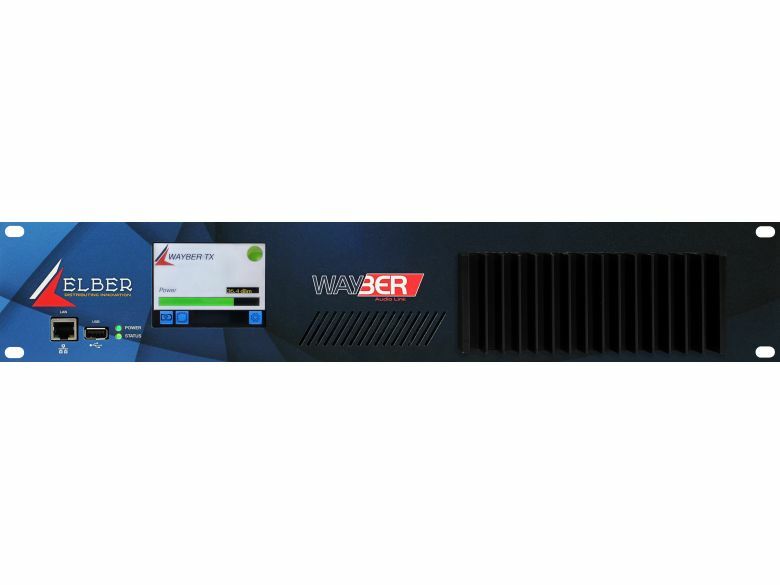 Wayber II is the name of an analogue/digital microwave link able to transport a Mono or a MPX stereo signal from studio to audio transmitter. Compact and reliable, it features very high quality and modern technology both in signal processing and microwave section leading to outstanding performances. This new equipment is compatible with T-R/NBFM from Elber, now out of sale. The front panel presents a 3.5” TFT touchscreen, the Ethernet managment port, a USB connector for customer authentication and firmware upgrade, and some leds for immediate information about equipment status. The back panel hosts all input/output connectors either for baseband and RF signals; baseband interfaces are Left and Right (analogue and AES-EBU), MPX, SCA and a “Transit” digital port. If inputs are Left and Right channel, the transmitter can act also as a stereo encoder, generating the MPX signal adding SCA subcarriers or creating RDS data through UECP protocol over RS-232 interface. The microwave section is wideband and can work between 400 MHz-1 GHz and 1-2.8 GHz. The system can work in analog narrow band (200 kHz) mode, or in digital 64QAM avoiding any degradation even in case of unlimited hops and ensuring low consumption. Based on a Linux embedded OS, it offers a very intuitive GUI, either through web and Touchscreen TFT display.